Both the name and the theory of degrowth aim explicitly to repoliticize environmentalism. Sustainable development and its more recent reincarnation “green growth” depoliticize genuine political antagonisms between alternative visions for the future. They render environmental problems technical, promising win-win solutions and the impossible goal of perpetuating economic growth without harming the environment. Ecologizing society, degrowthers argue, is not about implementing an alternative, better, or greener development. It is about imagining and enacting alternative visions to modern growth-based development. This essay explores such alternatives and identifies grassroots practices and political changes for facilitating a transition to a prosperous and equitable world without growth. The conflict between environment and growth is ever-present. For “developers,” the value of growth is not to be questioned: more mining, drilling, building, and manufacturing is necessary to expand the economy. Against developers stand radical environmentalists and local communities, who are often alone in questioning the inevitability of “a one-way future consisting only of growth.”1 In this opposition to development projects, philosopher Bruno Latour sees a fundamental rejection of modernity’s separation of means and ends.2 Radical environmentalists recognize that ecology, with its focus on connecting humans with one another and with the non-human world, is inherently at odds with growth that separates and conquers. The rise of mainstream discourse on sustainable development effectively erased the radical promise of ecology. The notion of sustainability that emerged from the 1992 Earth Summit neutralized and depoliticized the conflict between environment and growth. Since then, negotiations between government, businesses, and “pragmatic” environmentalists have assumed that new markets and technologies can simultaneously boost economic growth and protect natural systems. Environmental problems have been largely consigned to the realm of technical improvement, the province of experts and policy elites. Ten years ago, the provocative formulation of “degrowth”—a so-called “missile concept”—was put forward to challenge this de-politicization of environmentalism and attack the “oxymoron of sustainable development.”3 The use of a negative word for a positive project was intentional: by subverting the desirability of growth, degrowth aimed to identify and question the ideology that must be confronted in order to transition to a truly sustainable world: the ideology of growth. 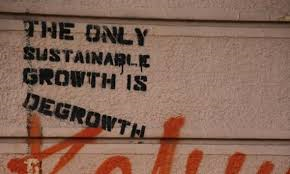 Degrowth theorists call for an “exit from the economy,” an invitation to abandon economistic thinking and construct viable alternatives to capitalism. However, proposing alternative economic models is not enough. We must also question the existence of an autonomous sphere called “the economy.” The “free market” is not a natural process; it has been constructed through deliberate governmental intervention. Repoliticization of the economy will require hard-fought institutional change to return it to democratic control. Degrowth proposals generally incorporate collective limits, such as caps on carbon emissions or 100% reserve requirements for banks. These are understood as “self-limitations,” collective decisions to refrain from pursuing all that could be pursued. Moreover, only social systems of limited size and complexity can be governed directly rather than by technocratic elites acting on behalf of the populace. Fossil fuels and nuclear power are dangerous not only because they pollute, but also because an energy-intensive society based on increasingly sophisticated technological systems managed by bureaucrats and technocrats will grow less democratic and egalitarian over time. Many degrowth advocates, therefore, oppose even “green” megastructures like high-speed trains or industrial-scale wind farms. Care can become the hallmark of an economy based on reproduction, rather than expansion. Reproduction refers to the activities that sustain the life cycle, typically within the family. But more generally, it encompasses all processes of sustenance and restoration. In the present economy, care work remains gendered, undervalued, and pushed into the shadow of the formal economy. Degrowth calls for the equal distribution of care work and the re-centering of society around it. A caring economy is labor-intensive precisely because human labor is what gives care its value. It thus has the potential to offset rising unemployment today while fostering a more humane society. Dépense refers to the unproductive expenditure of the social surplus. How civilizations allocate their surplus, the expenditures they make above and beyond what is necessary to meet basic human needs, gives them their collective character. The Egyptians devoted their surplus to pyramids, the Tibetans to an idle class of monks, and the Europeans of the Middle Ages to churches. In today’s capitalist civilization, as the surplus is accumulated and invested to produce more growth, dépense is displaced to privatized acts of exuberant consumption. Since limiting excessive consumption alone would fuel even more saving and investment, degrowth envisions radically reducing the surplus and deploying it for a festive society in which citizens devise new, non-harmful ways to dispense it, ways that help build community and collective meaning. There is a substantial body of evidence that demonstrates how growth threatens both environmental and social well-being.7 Continued economic growth makes us more likely to exceed the safe operating space defined by planetary boundaries, making life harder for everyone, especially the most vulnerable. Although “green growth” has become a buzzword in recent years, it remains an oxymoron. Its emphasis on enhanced efficiency creates a paradox: decreased resource requirements lead to lower costs and—by the simple workings of supply and demand—a rebound in the consumption of resources.8 This is part of the fundamental dynamic of capitalism: increasing productivity frees up resources that are invested to provide yet more growth. Continued economic growth in wealthy nations is also proving inimical to well-being. As Herman Daly observed, “illth” (congestion, crime, and other undesirable side effects) increases as fast as, or faster than, wealth as measured by GDP.9 Redistribution, not growth, is what improves well-being in affluent nations. Moreover, despite significant economic growth, people in the United States and most countries of the West are at best only marginally happier than they were in the 1950s. The wealthy are happier than the poor, but wealth, in the aggregate, does not translate into a higher average level of happiness because aspirations also increase and comparisons intensify with higher standards of living. Growth can never quench the desire for positional goods; only redistribution and new values can. What about those in poor nations who have yet to see the benefits of growth? Degrowth in the Global North can provide ecological space for the Global South. For example, strong carbon caps for the North and better terms of trade for the South can help compensate for past carbon and resource debts, redistributing wealth between North and South. Economic growth in the South, moreover, threatens alternative, non-monetized means of livelihood, generating the poverty that, in turn, makes more growth “necessary.” Degrowth in the North, then, can provide space for the flourishing of alternative cosmovisions and practices in the South, such as buen vivir in Latin America or ubuntu in Africa. These are alternatives to development, not alternative forms of development. Such projects display various facets of degrowth. They promote a shift to a more locally based economy with short production and consumption cycles. They emphasize reproduction and caring, to satisfy use values, not profits. They replace wage labor with voluntary activity. They do not have a built-in tendency to accumulate and expand, and they are less resource-intensive than their counterparts in the formal economy. Such practices of “commoning” cultivate solidarity and humane interpersonal relations, and generate shared, non-monetary wealth. As these alternative forms of provisioning suggest, a degrowth transition will be heavily bottom-up. However, broad institutional changes will be needed to foster adoption of such practices. For example, a guaranteed basic income would provide universal access to national wealth, securing basic sustenance for all and liberating time for non-paid activity. With the complementary policy of a job guarantee, the state could provide employment for all who wish to work in activities that support the common good. A shorter workweek and job sharing without a reduction of monthly wages could also combat unemployment and create more time for leisure and commoning. Adoption of these policies would reduce economic insecurity without the need for further economic growth. A transition beyond growth will entail a transition beyond capitalism, since the essence of capitalism is accumulation and expansion.11 A degrowth transition would likely follow a pattern similar to those of past systemic economic shifts. Capitalism arose from feudalism as connections were forged between new economic practices and entities (firms, corporations, trade contracts, banks, investments) and political and institutional developments supportive of these practices (abolition of monarchies and feudal privileges, enclosure of the commons, liberal democracy, laws protecting private property). A degrowth transition would differ sharply from the revolutions of the twentieth century, not only because it would be resolutely non-violent and democratic in character, but also because the target would not just be capitalism, but also productivism. An exit from growth requires an exit from capitalism, but an exit from capitalism does not necessarily bring an exit from growth. Twentieth century socialist regimes replaced the capitalist relations of production without changing the basic objective of resource exploitation and surplus accumulation for the sake of mass production and consumption. Despite the richness of degrowth theory, proponents are still grappling with questions of scale and governance. Advocates of degrowth privilege relocalization, anticipating that it will emerge and flourish, leading to a national political movement that can change the state from within. However, there is a tension between a desire for local autonomy and the need for action at a broader scale. A certain degree of hierarchy is unavoidable because the redistribution of burdens and resources among more and less privileged localities will require intermediation and decision-making at broad geographic levels. Some of the degrowth reforms discussed above are, in fact, quite interventionist and would require strong state action. Likewise, engagement with governance at a global scale is largely absent from the discussions within the degrowth movement. This is curious given the centrality of issues like climate change, free trade, and relentless global competition. Many degrowth advocates appear to assume that limitations on trade and capital at the national level will extricate a country from global economic forces, or that generalized global change will ensue as the aggregate effect of local grassroots initiatives. However, such developments remain unlikely. Climate change, for instance, cannot be tackled solely by summing up various local low-carbon initiatives in the absence of international agreements that cap total greenhouse gas emissions. Under the prevailing neoliberal regime, global interdependence makes it impossible for a country to undertake a degrowth transition on its own. Doing so would entail substantial penalties from capital flight, bank and currency collapses, asset devaluations, collapse of public and security institutions, and political isolation. This would undermine the ability of a nation to pursue a quiet contraction on its own. Likewise, if a single country or block of countries were to successfully downscale their economies, a global reduction of resource prices would likely follow, producing a rebound in consumption elsewhere. In a sense, then, escaping growth is a global collective action problem. To be successful, the transition to degrowth must be global. The phrase is from Ursula Le Guin, whose social science fiction novel The Dispossessed (London: Panther, 1975) provides a vivid exposition of a degrowth world. Bruno Latour, “To Modernize or to Ecologize? That’s the Question,” in Remaking Reality: Nature at the Millennium, eds. Noel Castree and Bruce Willems-Braun (New York: Routledge, 1998), 221-242. Serge Latouche, Farewell to Growth (Cambridge, UK: Polity, 2009). For a review of the unpublished francophone literature, see Valérie Fournier, “Escaping from the Economy: The Politics of Degrowth,” International Journal of Sociology and Social Policy 28, no. 11/12 (2008): 528-545, http://dx.doi.org/10.1108/01443330810915233. The choice of the term “degrowth” (décroissance in French) was inspired by the title of Nicholas Georgescu-Roegen, Jacques Grinevald, and Ivo Rens, Demain la Décroissance: Entropie-écologie-économie (Lausanne: Pierre-Marcel Favre, 1979). On degrowth as a “hypothesis,” see Giorgos Kallis, Christian Kerschner, and Joan Martinez-Alier, “The Economics of Degrowth,” Ecological Economics 84 (2012): 172-180, http://www.sciencedirect.com/science/article/pii/S0921800912003333. See Francois Schneider et al., “Crisis or Opportunity? Economic Degrowth for Social Equity and Ecological Sustainability: Introduction to this Special Issue,” Journal of Cleaner Production 18, no. 6 (2010): 511-518, http://www.sciencedirect.com/science/article/pii/S0959652610000259. Herman Daly, Beyond Growth: the Economics of Sustainable Development (Boston: Beacon Press, 1997). Giacomo D’Alisa et al., eds., Degrowth: A Vocabulary for a New Era (London: Routledge, 2014). See also www. vocabulary.degrowth.org. See D’Alisa et al., op. cit. ; Daly, op. cit. ; Tim Jackson, Prosperity without Growth (New York: Earthscan, 2008). Blake Alcott, “Jevons’ paradox,” Ecological Economics 54, no. 1 (2005): 9-21, http://www.sciencedirect.com/science/article/pii/S0921800905001084. Joana Conill et al., Otra vida es posible: prácticas alternativas durante la crisis (Barcelona: Ediciones UOC Press, 2012); Julie Katherine Gibson-Graham, The End of Capitalism (As We Knew It): A Feminist Critique of Political Economy (Minneapolis: University of Minnesota Press, 2006). Capitalism can experience involuntary negative growth, but not for long, as this would lead to intensifying inequalities and socio-political instability, and the threat of the imposition of some form of autocracy. Ashish Kothari, “Radical Ecological Democracy: A Path Forward for India and Beyond,” The Great Transition Initiative (July 2014), http://greattransition.org/publication/radical-ecological-democracy-a-path-forward-for-india- and-beyond. “For “developers,” the value of growth is not to be questioned: more mining, drilling, building, and manufacturing is necessary to expand the economy. “Undoubtedly many capitalists and/or the political representatives/advocates of capitalists, think like this, but growth is conventionally measured by mainstream economists in terms of the monetary value of transactions, (usually called GNP and GDP) and this is one reason why growth is a tricky concept for greens and the labour movement. Many transactions involve monetary exchange and not all of these directly involve the extraction of raw materials, environmental damage and pollution, and this makes GNP and GDP slightly problematic as measures of growth. Changes in the level of consumption of services could mean more or less growth statistically without changing the ecological impact of the economy concerned much. Similarly reconstructing infrastructure along more eco-friendly lines, and hopefully creating at least a million ‘climate jobs’, might involve less mining, drilling, building, and manufacturing, in the long run, but would probably initially, and for a while, involve differences in such activities, not their cessation. Such a transformation could still involve an expanding economy as measured by GNP and GDP. Going on about degrowth, or greens opposing growth just alienates workers and their organisations and political representatives. Well you can't have it both ways. We have to expect unions to be pro-capitalist, they always have been. What will the UK be like in the 2020s?